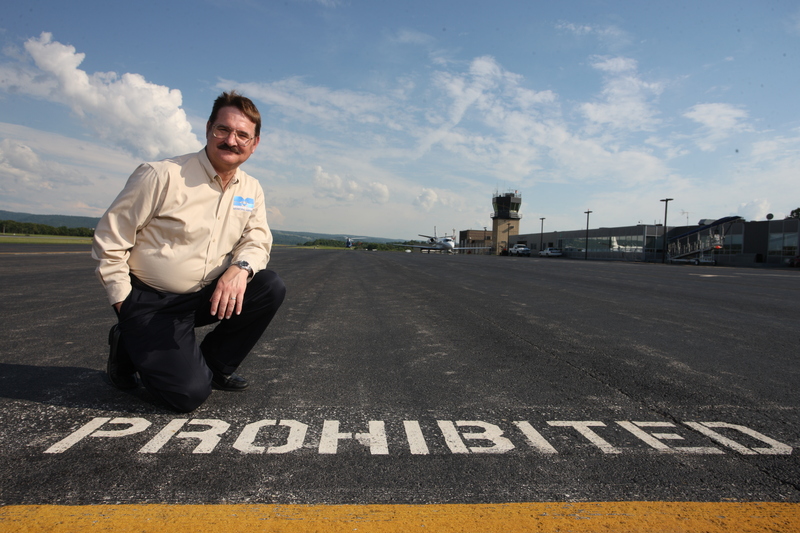 It’s 7:30 a.m., and Michael Clow (’78 naval science) is walking through the Morgantown Municipal Airport. He’s checking out the facility and the airport grounds, looking for anything out of the ordinary, anything that’s not functioning properly, anything that’s not perfectly clean. He stops to talk to the pilots, the rental car representatives, and the United Express agents. It’s the way Michael starts each day as the director of the Morgantown Municipal Airport. The daily walk-through is followed by meetings, perhaps a discussion with the FAA or the state aeronautical commission, and media inquiries. “When anything is going on in the world regarding air travel, [local reporters] call me,” Michael said. The Morgantown position is a step up from Michael’s previous jobs at the Tallahassee, Fla., airport, where he spent 13 years, most recently as the airport’s planning and development manager. He arrived in Morgantown in September 2011, just as West Virginia University joined the Big 12 Conference. Morgantown Municipal is a relatively small airport, with about 40,000 operations (takeoffs and landings) each year. The airport is served by United Express through Washington, D.C.
Michael and his wife, Teri, enjoy living in a college town. “Morgantown is a great place to live,” he says.